We manufacture all our own cables you may any length your require. To make ordering easier we have listed several of the more popular lengths. This cable is 2m long and has a female XLR connector on one end and a male XLR on the other. 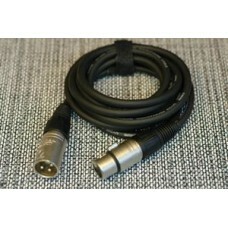 This is a standard microphone cable. The female XLR end will fit in to our power adaptors and the male end will then fit in to any microphone input on a mixer or amplifier. This is our recommended method of connecting our microphone systems.